Baked bread again yesterday. Follow this recipe, however replace half of the wholemeal wheat flour with stoneground spelt flour. I baked bread today and gave one to my friend, The Queen King, when we met for coffee. Even though it was zero degrees during the 15 minute cycle into Eton it remained warm from the oven, wrapped inside an old linen tea-towel in the pannier bag. The Queen King said she’d never been given a loaf of bread as a present before, as she cuddled its warmth. I hope she liked it, especially as I gave her the better of the two loaves. I highly recommend baking your own bread whenever you have the chance to do so. Also, get yourself a copy of “Bread Matters” by Andrew Whitley (http://www.breadmatters.com/book/). 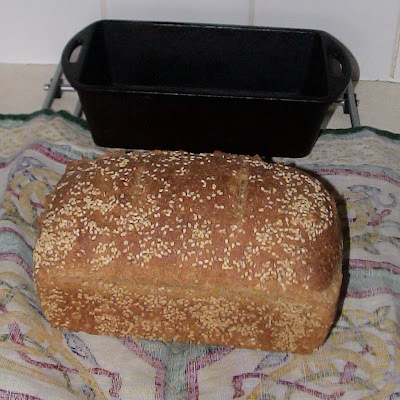 This recipe is an adaption of the basic wholemeal bread recipe from that book. Anyone who hasn’t made bread from scratch probably thinks it takes really long time. Well it kinda does and it kinda doesn’t. From reaching for the scales to having a slice of bread does take about three to three and a half hours elapsed time. However, you’re only actually doing something for 20 minutes at the beginning, then 10 minutes later, then 5 minutes later again. In between….what ever turns you on. Heavy duty bread mold. Heavy cast iron is best, followed by heavy duty glazed pottery. Lightly coat with olive oil (too much and the bread will fry). Do not use a thin metal cake tin (the metals expands and “pops” in the oven which can “shock” the bread and deflate it). Do not use glass – the bread sticks to it terribly. Do not use non stick – because non stick is just blah. By the way….this is all bread needs. Compare this list with the ingredients list on the side of a standard supermarket loaf of bread. All that other crap they put in there is there all to make it possible to make bread according to what’s called the “Chorleywood Method” of bread making – which is the high industrialised method that skirts the need to allow the bread to rise and prove. Note: the ideal temperature for the bread mix is about 27c. On a really cold day, when all the ingredients are cold, the bowl is cold, the bench is cold and so on the coolness will hamper the growth of the yeast in the dough, and the feeding cycle of the yeast on the sugars in the flour. This will result in a somewhat unrisen loaf which is akin to a brick. Therefore, adjust the temperature of the water in the mix to create a warm dough. Just don’t dissolve the yeast in boiled water – you’ll kill it with too much heat. Now…roll up your sleaves and come to terms with the fact that you’re going to get dough on your hands. Using your hands….mix it all up in the bowl until the dough begins to form a kneadable mixture – which should only take about a minute. Scoop out the dough and firmly knead on a bench for 12 minutes. If you’ve never kneaded bread before: take particular note of how the dough changes consistency as it is kneaded over the 12 minute period. These changes in consistency are due to the flour taking up the water and the gluten bonds beginning to form. At the end of kneading: “fold” the dough to create a “ball” (should be about 15cms in diameter) and then place “seam down” back in your original bowl. Go and wash your hands in warm, soapy water NOW. If you can stand to do so use a soft brush like one normally used for scrubbing under your nails to help get the dough off. Special note for men with hairy hands: get the dough off your hands thoroughly NOW because it is REALLY painful to pull it off all those hairs once it dries; you’ll also spend the next few hours explaining to people that “No…that is not dried snot on the back of my hands”. Cover the bowl with cling wrap. Note: the bowl should be deep enough so that the dough isn’t touching the cling wrap as it rises. Not only would that prevent the dough from rising evenly, cling wrap is blah. In VegHead’s kitchen it is only used very sparingly and only for one or two particular purposes and only when it won’t be sitting touching food. This is one of those times. While you’re at it, the bread mold you’re going to need later shouldn’t be stone-cold either. I put the mold in the same cupboard as the dough so that it warms up to the same temperature. Set a reminder timer and go do something else for 2 hours…. ….After 2 hours….the dough should have noticeably risen (at least doubling in size), retrieve it and also the bread mold. Scoop out and knock back the dough. Stretch it out lightly and fold it back on itself “in thirds” i.e. don’t fold it back in half, fold it back a third of the way and then again. Repeat last step twice more. Fold the dough to a suitable shape to place it in the mold. The folded shape should be about two thirds of the size of your mold. Place the dough into the mold with the “seam” of the folded dough facing down. Set a reminder timer and go do something else for 20 to 30 minutes…. Allow to cool before slicing. If you slice very hot bread straight out of the oven its always doughy – better to leave it to cool down.